This is the second in a series of four posts. Here is the set-up if you missed our first post. Many Emerging Food Brands we talked to since our first conference have been out-growing their commercial kitchens and are trying to decide between expanding their operations or moving to a contract manufacturer or co-packer. Obviously, both routes come with risk. While financing operational growth by building out a plant is a major investment, most folks say they are interested in exploring that route so they can maintain high-quality product standards. But are they correct? Will the product suffer in the transition to a co-packer? There are a lot of questions about working with co-packers and Emerging Food Brands brought them to the NewPoint Emerging Food Brands Conference. Questions about co-packing? 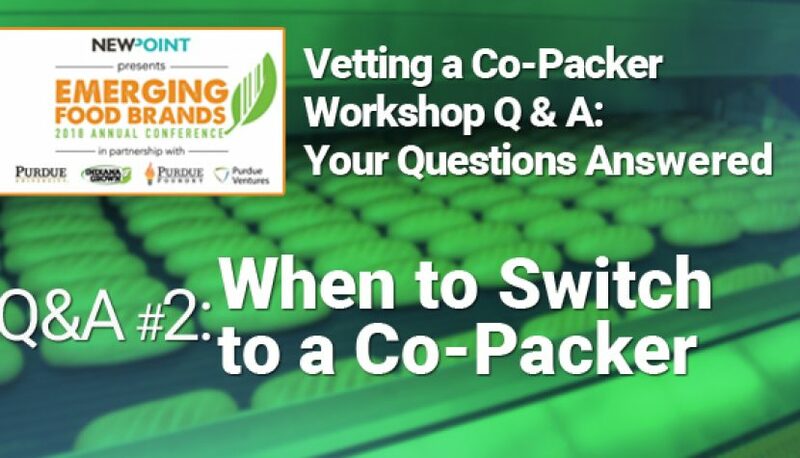 The content of this Vetting a Co-packer & Best Practices for Growth portion (and all program content at our conference) was submitted as questions during registration by the 64 food company/brand attendees. Our expert presenters then addressed the questions—and more—in their programs. In the coming weeks, we’ll be posting each presentation to the “Intel” section of our website. So check back often! Erik Kurdelak: Manager of the Pilot Plant in Purdue University’s Department of Food Science. John Wisler: Consultant for the Food and Beverage Industry under Food and Beverage Consulting LLC, advisor to the Food Processing Supplier Association(FPSA), and International Society of Beverage Technologist (ISBT) supporting companies in the United States, New Zealand, China, and India. Mike Albregts: Owner at Pinhook Foods LLC is a food industry consultant and Purdue Alum. Formerly with Kraft. 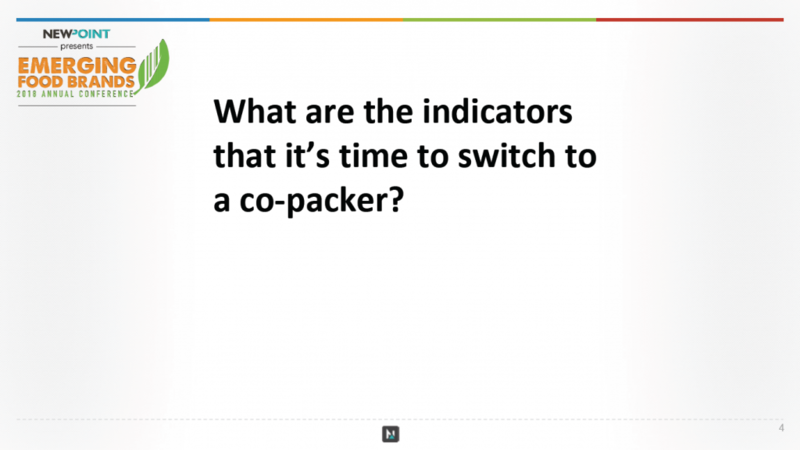 Vetting a Co-Packer Question #3: What are the indicators that it’s time to switch to a co-packer? Erik Kurdelak: You will probably know when it’s time to switch to a co-packer. A big one, of course, is going to be on filling orders. You’ve got more demand than what your production capacity can satisfy. You’ve got a certain amount of production capacity if you’re at home, or if you’re in a commercial kitchen, or if you’re building out an operation. 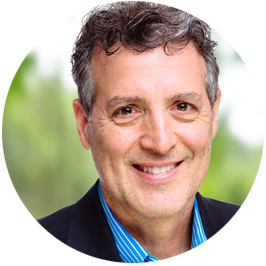 You’re going to have a certain amount of production volume that you can actually execute. That’s a good indicator it may be time to look for help. Even if you decide to build out a facility, make a new line, make new additions, these take time–and in the meantime, you don’t want those customers hanging there waiting on a response from you. If you are building a facility, you are going to want to make sure it’s truly efficient so you can pay for your equipment 24 hours a day. You’ll want to make sure that you’re running it and that it’s paying you back as much as possible. You don’t want idle equipment, right? You want to make sure that you’re actually maximizing your assets. What I do in the Purdue Food Sciences Pilot Plant and Product Development Lab is help people to make that jump, or transition, from one scale to a larger scale or to switch to a co-packer. We’re here to help people be prepared and minimize the risk of costing yourselves money and losing potential resources though ingredients, time, and all the rest. Mike Albregts: Chances are you’re probably manufacturing and selling the product yourself. You get to the point where you’re manufacturing and you’re not selling, because anybody can manufacture something, but you’ve got to be able to sell it. That’s really what drives your business. So when you’re spending too much time making it, and not enough selling it, you’re going to go the wrong way on your balance sheet anyway. That’s really what you’ve got to look at. It’s going to cost you to get it made. I mean, that service is there. It may shrink your margin a little bit, it may, but they may have some buying opportunities to buy products in larger volumes than you have. If you can dovetail in and use some of the same products that they have on the shelf, then those may take up some of that slack. 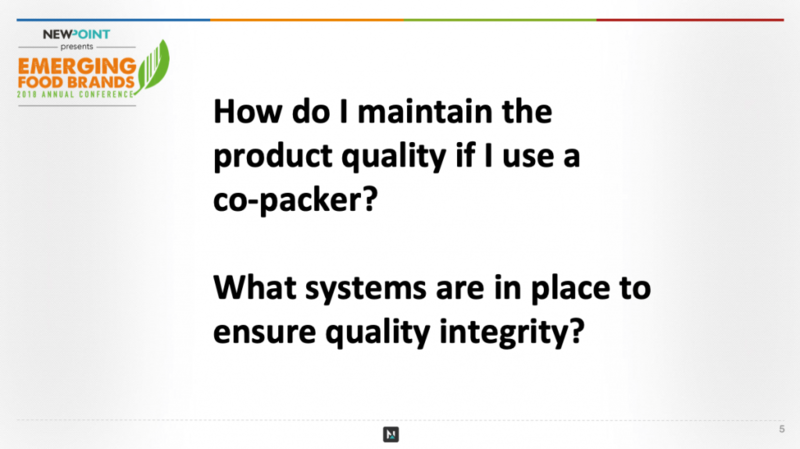 Vetting a Co-Packer Question #4: How do I maintain the product quality if I use a co-packer? What systems are in place to ensure quality integrity? Mike Albregts: How many people in here know what a COA is? Okay, a COA is a certificate analysis. I can tell you, I just did a run on a mayonnaise product, kind of like a flavored mayonnaise product, and I require that they do three things: they test for three things, listeria, salmonella, which you cannot have, and then we do a generic E-Coli, which is an indicator of sanitation. It has to pass those three things before I’ll take the product, and then they’ll send me a COA with all these data points that they’ve taken throughout the run in the product. Your co-packing partner is constantly checking the PH and the water activity. This is a shelf stable item, so we have to meet these certain parameters before it’s shelf stable. You’ll get this data, and you’ll look at it, and you’ll go, “Oh my God, it’s variable.” Well, it does vary because it’s usually not–on a 43,000-ton load of mayonnaise, it’s usually not all done in the same batch. It’s either done on a continuous, or it’s done in multiple batches and then filled. So, don’t freak out completely if all the numbers don’t match exactly, but you have a range in there on that water activity, on that PH that you have to hit, and those are the things you have to stay within the range. Erik Kurdelak: It’s really important because you have a certain vision for your product. It’s the sauce that grandma made, we’ve been enjoying it for generations, we want to share it with the world. We don’t want to put it out there into this mainstream and have it be totally altered by some co-manufacturer. How do you maintain those expectations? You have an expectation for your product so you’ve got to know, again, those flexible points and also the fixed points. What are you willing to give? But also make sure that you are, for example, vetting ingredient suppliers. Make sure you have the COA’s, making sure that you have nondisclosure agreements, making sure that you have certain things in place to protect yourself. In defining your own specifications, the tighter you define it the more likely that it is going to meet your expectations, but also it’s going to be much, much harder to find anyone to actually fill that run. So, there’s a balance point here. There definitely is a balance point to that. But definitely, look at your certificate analysis, look at if they’re SQF certified, look at what is their standing. Are they inspected space? Who’s doing these inspections? Ask them about it, ask about their allergen program, ask about their pest control program. Walk around the facility before you commit to a run. These things are expensive. You want to know what you’re getting into. I mean, these are important things. Every brand and company is different: The experts here are addressing general questions from a wide variety of companies. Use their advice and guidelines as a starting point. This is the second in our series of Vetting a Co-Packer posts. Please stay tuned as we bring the next few questions in a few days. Want to talk about co-manufacturing or maybe walk through something in this post? I’d love to hear from you. Contact me at patrick@newpointmarketing.com. And, as always, Keep Moving Your Brand Up the Food Chain!